Spacious and well situated, this individually-built three-bedroom includes a detached garage, ample driveway parking, private rear garden, two bathrooms, dining kitchen & more! Recent improvements include a replacement boiler and a multi-fuel burner. Viewing highly recommended. EPC C.
A white uPVC double glazed front door opens into the dining kitchen, which is lit by a complimenting window to the front of the property. This generously proportioned room allows space for most family dining tables, and is well equipped with a range of light oak effect wall and base units with black marble effect roll-top work surfaces. There is also a stainless steel one and a half bowl sink unit and a selection of appliances including an integral electric oven, four ring gas hob with extractor hood over, plus plumbing for an automatic washing machine and space for a free standing fridge-freezer. The room is finished in contemporary shades of cream with tiled splashbacks, ceramic marble-effect tiled floor, two ceiling lights, radiator and selection of power points. A white colonial door leads to the downstairs shower room. A second door leads to the lounge. A white UPVC double glazed obscure window brightens the room, which has been decorated in neutral shades with a marble-effect tiled floor. Recently equipped with a white low flush WC, hand wash basin, shower enclosure with an electric shower and resin splashback, there is also a ceiling light and radiator. The Baxi combi boiler, fitted 2017, is mounted on the wall. Designed with the family in mind, this spacious lounge enjoys a recently fitted multi-fuel burner with contemporary hearth and surround. Decorated in red with Karndean flooring and white skirting, there are also two ceiling lights, media connections, a radiator with TRV and selection of power points. A set of white uPVC double glazed French doors, with complimenting window, offer a great view over the private rear garden and provide access to the rear terrace. A wooden colonial door allows access to a handy under-stairs cupboard, while a second door leads to the stairs for the first floor. A set of cream carpeted stairs lead up to the first-floor landing. Decorated in light cream with white skirting and balustrade, there is also a radiator, power point, and a ceiling light. The space provides access to all first-floor rooms via white colonial doors, and to the loft via a ceiling hatch. This well-proportioned double bedroom is lit by a white uPVC double glazed window to the front elevation and includes a ceiling light, radiator and selection of power points. The second bedroom is lit by a white UPVC double glazed window to the rear of the property and includes a ceiling light, radiator and selection of power points. Lit by a white uPVC double glazed window to the rear of the property, the third bedroom is equipped with a radiator, ceiling light and selection of power points. Lit by an obscure white uPVC double glazed window to the front of the property, the family bathroom is equipped with a low flush WC, hand wash basin and bath tub with a shower mixer bar off the combi. Finished with white tiled splashbacks, light blue paint and mosaic effect vinyl flooring. There is also a radiator, ceiling spotlights and extractor fan. A neat paved front garden with feature pebbled bed provides pedestrian access to the front door, edged by a low brick wall. To the side, a tarmacadam with a pair of wrought iron gates opens onto the driveway, with parking several cars. At the end of the driveway is the well-proportioned detached garage of pitched roof construction with an up and over door, ceiling light and power points. A wooden picket fence with complimenting gate leads from the driveway to an enclosed lawn with mature beds, a selection of trees and high timber boundaries. Also from the drive, a set of paved steps leads to an elevated terrace area, ideal for plant pots and garden furniture, allowing access to the rear patio doors and a charming view over the private rear garden. Set on a quiet street with easy access to local amenities including shops, medical facilities, schools and bus routes and countryside walks at the opposite end of the road, this individually built family home is a must-see. The village of Selston is well regarded, with a great community spirit and plenty of local groups and hobbyists to suit most tastes. 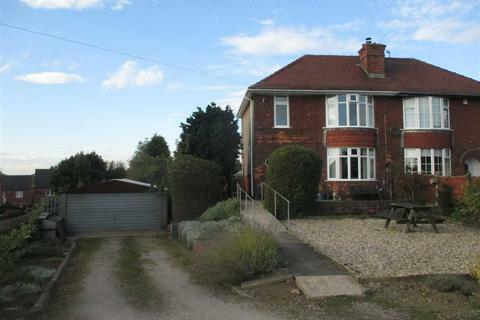 The property lies approximately 1 mile from Junction 27 of M1, with other popular routes such as A610 and A38 for larger townships like Alfreton, Mansfield, Nottingham and Derby. Property reference 20480. The information displayed about this property comprises a property advertisement. OnTheMarket.com makes no warranty as to the accuracy or completeness of the advertisement or any linked or associated information, and OnTheMarket.com has no control over the content. This property advertisement does not constitute property particulars. The information is provided and maintained by MCM Estates & Lettings - Jacksdale. Please contact the selling agent directly to obtain any information which may be available under the terms of The Energy Performance of Buildings (Certificates and Inspections) (England and Wales) Regulations 2007 or the Home Report if in relation to a residential property in Scotland. 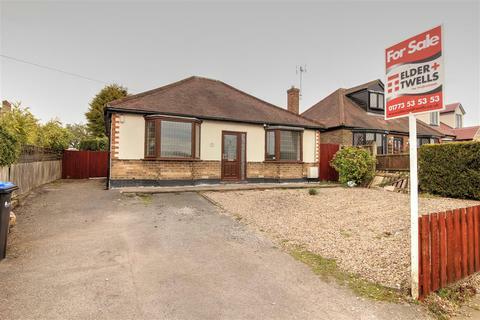 *No Onward Chain* A spacious two double bedroom detached bungalow, kitchen with utility, bathroom, generous dining lounge, lovely private garden and parking to the front, located in a desirable and peaceful spot in Selston. EPC rating D.